In a phone conversation with a friend once, she let slip the F-bomb. Not that F-bomb. The other one. She said in passing, "...and you know, babies cost a fortune." I'm glad she couldn't see me because I'm sure I made a face. Eleven years and 5 kids into this becoming a mom thing, I'm convinced that babies simply cost whatever we want to spend on them. I didn't bother to correct my friend because I hear it everywhere. 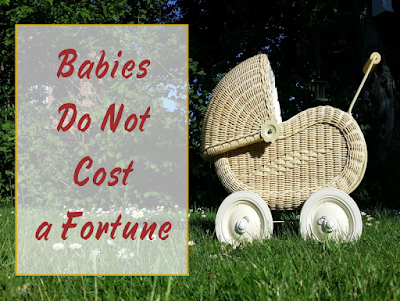 You have to save up for years if you're considering having a baby. Don't even think about having a baby until you've moved into a ginormous house and achieved financial nirvana. Mailings from Babies 'R Us would have me believe I need to devote an entire room of my house to my baby, furnish it with a coordinating crib and dresser/diaper changing table combo in walnut or cherry (depending on my style,) and buy a thousand dollars of matchy-matchy decor to fill out the room. But up until the late 1900s nurseries weren't even a thing, and you probably have at least one grandparent that spent his or her first few months of life sleeping in a dresser drawer. I'm not necessarily advocating a return to dresser drawers, but I am pointing out that babies don't need a lot of space or stuff, they just need love and enough room to set up a Pack 'n Play in the corner. I know because we've done this, when our third child joined the family and we were living in an 820-square-foot apartment. Nowhere we've lived have we ever had a nursery. Over the years we've had babies rooming with us, with their siblings, or even temporarily in a closet, the basement, or the master bathroom. I've seen babies with their own personal closets full of baby-sized clothes on baby-sized hangers and 2-year-olds with more purses and shoes than I've owned in my entire lifetime, but most kids just don't need more than a week's worth of clothes and you can find them at a consignment/thrift shop, yard sale, or your friend down the street giving away her son's outgrown things. I have to admit, the USDA's estimate that it costs an average of $245,000 to raise a child from birth to age 18 makes me freak out a little. I decided to spend a little time playing around with the USDA child cost calculator myself to see what's supposed to make little people so expensive. It asked what region I live in, how old my kids are, and what our household income is, then told me how much each one of them cost to raise this year — broken down into housing, food, transportation, clothing, health care, child care and education, and miscellaneous expenses for each one. I know it's just a computer-generated algorithm, but there were serious problems with this thing. Second, it must assume I'm exclusively formula feeding (since I'm told to budget $1,591 for baby's food for the first year) and using full-time daycare (since it projects over $5,000 in childcare costs.) In reality, we've dropped maybe a few hundred on formula to supplement and $30 for that one time we got a sitter in the spring. Actually, I thought the numbers in every category were too high, like the estimated $45 per week on food for my 11-year-old when really, a weekly grocery trip for our entire family of 7 is about $150. Long story short, since we're not teetering on the edge of financial ruin like the USDA calculator says we should be, I think it's wise to take the old "babies cost a fortune" adage with a grain of salt. Possibly one of those giant blocks of salt lick they make for horses. I agree! Our son did have a cute crib, a dresser (which we put a changing pad on cause I was not going to do it on the floor due to pain in my back!) and a closet full of clothes (hand me downs from 4 older boy cousins). I love shopping on consignment websites, getting good deals, and with all those clothes the kid has- I think we have a pile ON the dresser that we go through instead of the cute ones hanging in his closet. Babies have very few necessities and lots and lots of extras that are nice to have, it's just important to remember which are which! Love hand-me-downs and after-season clearance. Yeah, WOW! Babies only cost a fortune if you want to spend it- you hit the nail right on the nail there, Jenny! I buy all the grand's clothes at consignment, or deeply discounted with coupons! clearance sales. My daughter refused to even let me buy her shoes for the first year! I went ahead anyway, a few times, and they only touched her feet for 5 seconds, for a photo op! I learned that lesson the hard way! Anyway, I think that's way too outrageous too. I'm loving the minimalist, and tiny house movements, because people are moving twards what REALLY matters- PEOPLE!! nail on the HEAD, not nail!! Totally agree. I don't think they should be factoring in things like housing and transportation because I don't think for most people those things make a difference... like you mentioned, you are still living in a house baby or not, and most likely it will be the same house especially if you already have a kid or two. We have this little private joke in our family. I store all of the children's clothes that are waiting for the next sibling in the crawl space under the stairs and once someone complimented my preschooler on her dress and asked where she got it. She responded, "under the stairs". Yep, mine do not know you can buy new at a store... It all comes from under the stairs. With the really generous child support everyone gets in France, Ze Husband and I reckon we actually MADE money with child #1. Now we're living in the UK, that's far from being the case, but we also don't spend anywhere near what the statistics say. Our pushchair? £10 from a garage sale. We vaguely thought about getting a double (since we have 2 under 2), but in the end, child #2 stands on the footplate whilst #3 is in the seat. I think you just have to be willing to go against the flow! I agree. If you buy every cool baby gadget your life might be a little easier, but you can often get by spending a lot less and it'll be okay. Ours come from the attic, same story. If you buy all they say you 'need', you won't have any room in your house for the baby, or the parents. We have six children and live on the same income we've always had. We did choose to upgrade to a passenger van, but it ended up saving us on our monthly notes. I feel like we get more bang for our buck having used our $100 mini crib six times over! The pack n play I spent $50 on lasted 9 years through 4 babies until we demoted it to outdoor use only and got a new one.